Since its launch, Nintendo’s social app Miitomo has amassed over four million users and will probably gain a few more when items from the hugely popular game Splatoon land next week. 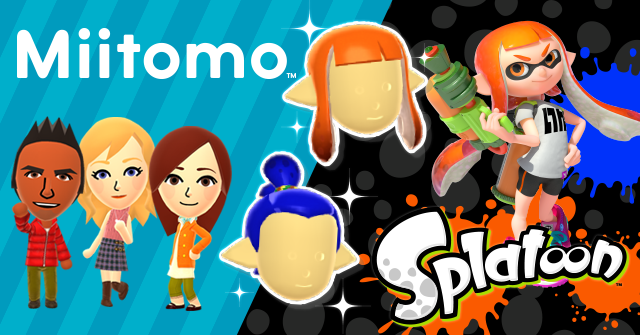 Nintendo has revealed that the headwear, clothing and more from Splatoon will be made available in Miitomo for a limited time only so everyone can dress their Miis as Inklings. Using the popularity of Splatoon and the millions of Miitomo users, its also launching a bit of a social advertising campaign by offering to give the Inkling boy wig away in the app for free if its promotional hashtag gets 10,000 retweets on Twitter and if it gets 20,000 the girl wig will be free too. Fear not though, it’s already got over 17,000 retweets so just a few more and both wigs will be available for everyone to wear. As well as wigs, you’ll be able to unlock things like Inkling t-shirts, shorts and shoes in the Miitomo Drop mini-game. And if you’ve got some spare coins, you will be able to snag some squid pins in the Miitomo store. If you’re Miitomo account is tied to your My Nintendo one, then you’ll have the added bonus option of buying a special ink tank – but it will cost you Platinum Points so you’ll have to complete some missions to get it. Splatoon and Miitomo have both been massively popular and successful for Nintendo so it’s not too surprising to see the company put the pair together. This is the first real game-related promo being offered in Miitomo and could potentially be a sign of more to come. 2016 is the year of Pokémon’s 20th anniversary after all so who knows what might pop up.